Chaperones are integral parts of outdoor science programs and can include classroom teachers, parent volunteers, young adults, or high school student volunteers in charge of supporting students. Chaperones usually take the lead on managing students during mealtimes and shower times, as well as helping groups of students build rapport and connect to one another throughout the week during downtimes. Although field instructors are primarily in the role of teaching, facilitating, and leading activities during learning experiences, chaperones also play a critical role in supporting the function of a group during student learning experiences. A chaperone who enthusiastically participates in group activities and is able to help students engage in the program can really improve a field experience, while a chaperone who is distracting or who acts without an awareness of the instructor’s goals can make a program far more difficult. 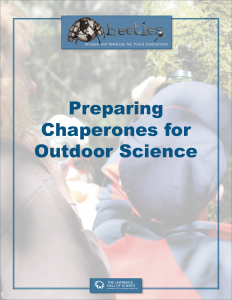 This short guide includes three versions of what an instructor or program leader could do with chaperones to prepare them specifically to support outdoor science learning and the group’s nature exploration.